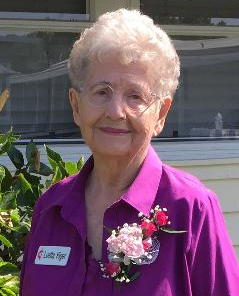 Luetta Jean Kiger, 93, passed away April 3, 2019. Born August 12, 1925 in Hidalgo, IL. Daughter of Claude and Neva Bownam. Luetta was raised in Illinois and Evansville, IN before moving to Akron, OH where she attended high school. She met her future husband, George William (Bill) Kiger in Akron in the fall of 1941. After WWII started Bill joined the navy and while on leave, they were married December 2, 1945 in Evansville, IN. They were married for over 51 years. Luetta and Bill lived in Owosso, MI for 32 years. In addition to raising a family of three children, she worked as a Secretary for Johnson Controls and the Ann Arbor Railroad. Luetta loved to cook and she was at her best when making dinner for her family and friends. She was a member of the First Church of Christ in Owosso. Luetta and Bill moved to Lake Placid, FL in 1992. Bill passed away in March of 1997 and Luetta remained in Tropical Harbor Estates until 2017. They were members of Memorial United Methodist Church. She did volunteer work for Nu-Hope in Lake Placid. She enjoyed attending classes at the local college on various subjects and attending the summer concert series. Luetta loved to travel and visited her family every summer as well as a trip to Europe with her cousins. Luetta is survived by her son Terry (Sheree) Kiger, daughters, Kathy Tarrant and Connie Irby, Grandchildren Jeffrey (Cindy Loebel) Kiger, Justin (Nicci Houzenga) Kiger, Lori (Corey) Albert, Charles (Kris)Tarrant, Andrew (Amy) Irby, numerous Great Grandchildren, her sister Nancy Kulow, as well as cousins, nieces and nephews. She was predeceased by her Granddaughter, Jennifer Jean Irby, Great-Granddaughter Melanie Luft, and her brothers Charles Wayne Bowman and Donald Glen Bowman. Luetta passed away on April 3, 2019 in St. Petersburg, FL. Burial will take place at The Florida National Cemetery in Bushnell, FL. Visitation will take place Monday, April 8, 2019 from 5-7 pm at David C. Gross Funeral Homes, 6366 Central Ave, St. Petersburg, where funeral services will be 10:30am Tuesday. Burial will follow at 2pm Florida National Cemetery, Bushnell. David C. Gross Funeral Homes, Central Ave. Chapel in St. Petersburg is serving the family.